NASCAR Race Mom: Every Fan Vote Was Crucial - Moses Smith Wins MPD By Percentage Points. Every Fan Vote Was Crucial - Moses Smith Wins MPD By Percentage Points. DAYTONA BEACH, Fla. (Dec. 14, 2008) – Saturday night at the final awards banquet of the 2008 season, NASCAR Whelen Modified Tour champion Ted Christopher was also honored as the series’ Most Popular Driver. He was the last of eight drivers to receive the honor via first-time fan voting on www.nascar.com and through www.nascarhometracks.com, the official NASCAR Developmental Series website. The Most Popular Driver award wasn’t revealed until each series’ season-ending banquet. 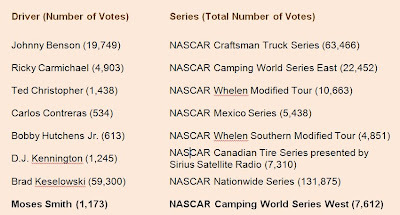 More than 253,000 votes were cast for 258 drivers in the NASCAR Nationwide Series, NASCAR Craftsman Truck Series and each of NASCAR’s six national touring series. Voting began July 7 and closed for each series as its season ended. In addition, many track and team/driver web sites throughout NASCAR carried the links to voting on www.nascar.com. Brad Keselowski, the Most Popular Driver in the NASCAR Nationwide Series, led all drivers with 59,300 votes. Fans cast 131,875 votes for drivers in the NASCAR Nationwide Series, tops among the eight series. Every fan vote was crucial, especially in one series. The closest battle was in the NASCAR Camping World Series West where Moses Smith won the award by percentage points over Austin Cameron. Of the 7,612 votes tallied, Smith earned 15.409% while Cameron totaled 15.151%. Two series champions were also voted as Most Popular Drivers – Christopher and Johnny Benson (NASCAR Craftsman Truck Series). But the other six winners were drivers inside – and outside – their series’ final championship Top 10, illustrating the fans’ passion for their favorites regardless of ranking. Moses Smith and Austin Cameron, along with Series Champion Eric Holmes, raced the 2008 season as Bill McAnally teammates. Moses finished the season sixth in the Championship while Cameron came in at seventh. Having all three of his drivers in the top ten was quite an accomplishment for the McAnally shop. nice and yes it takes everyone voting to make the difference!